It is with deep sadness that we announce the death of our beloved friend and colleague in the work for justice, Fr. Darrell Rupiper, omi. Darrell was a tireless advocate for the poor and passionate about preserving the integrity of God’s creation. 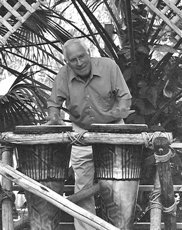 In recent years, he led countless of individuals to a greater connection with God and nature through his Eco-Mission workshops. Memories of his consistent good humor and kindness will remain with us as we carry on in his absence. He passed away on February 10th.